You can purchase these if you do not wish to wait. We are giving away one shirt to two lucky randomly selected winners. 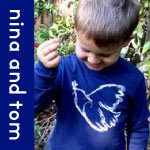 These are 100% US grown & sewn organic cotton, printed and designed by us, nina and tom. 2. Which shirt and size would you want if you won? "My wife likes to spoon but I prefer to fork." 4. Would you like our newsletter, if you do not already receive it? I would like the "My wife likes to spoon but I prefer to fork." L T-shirt. I do not not wont the newsletter. No thanks for newsletter but thanks for the great giveaway!
" My wife likes to spoon but I prefer to fork." I love the "My wife wants to spoon but I prefer to fork" in size med for my horney husband. If we win you can email us at moonshadow43@gmail.com and I would love to subscribe to your newsletter also. I would love to win. My husband totally needs to have the "My wife wants to spoon" t-shirt. OMG I just spit out my coffee that is so funny and so much like him. cre8tveminde at optonline dot net. My husband would love "Daddy needs some love'n" in a L.
size XL in the "Daddy needs some love'n" please. already get your newsletter...keep it comin'! 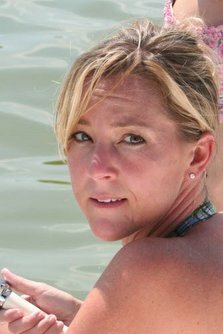 I would love your newsletter. Thank you!! My Husband would love My wife likes to spoon,but i prefer to fork Size L,I would love your newsletter,Thanks! Yes to the newsletter, thanks! Daddy needs some love'n size XL -- already get newsletter. fingers crossed for daddy! Too funny. MY WIFE LIKES TO SPOON I PREFER TO FORK. In XL. spoon/fork, XL, jennem22 at yahoo dot com, no thank you! I'd like Daddy needs some love'n in XXL. My wife loves to spoon, etc. i'll pass on the newsletter. I would pick "Daddy needs some loven". XL. Yes I would like your newsletter. I like My Wife Likes to Spoon and yes I would like your newsletter! "Daddy needs some love'n." in XL is you pick me, pick me! My wife likes to spoon..in large. That is soooo hilarious, I lol when I read it! Thank you! No newsletter please. "Daddy needs some love'n" shirt in XXL please. No thanks for th newsletter. Sure I'll take the newletter! Daddy needs some love'n No news letter please. Have a great day. No thanks for now, to the newsletter. Thank you, but no newsletter. I would love to win the "daddy needs some love'n" in XXl. Omigosh! I am laughing sooooooo hard right now at this design. I'd love the spoon/fork t-shirt. I'm already subscribed through google reader. 4. not at this time...thank you. daddy needs some lov'n----cause he thinks he always does! XXL---yes I'd like your newsletter! and no newsletter at this time. I need the first one involving the spoon.I have to get my own fathers day gift. "Daddy...." t-shirt, size Large and yes on the newsletter. 2. "My wife likes to spoon, but I prefer to fork." in size XL. 4. I receive it already, but thank you for asking. I really enjoy reading it and the blog. I already get the newsletter I think, but would love it if I'm not already on the list! I like 'My wife likes to spoon but I prefer to fork' size XL. I'm pretty sure I'm receiving your newsletter, but if not please add me. i get the newsletter, thanks. Oh my word, I'd have to go with the t-shirt that says 'Daddy needs some love'n' for my husband. He says that ALL THE TIME! Oh, in a sixe XXL. We get your newsletter and love it! how fun, please enter me for the My wife likes to spoon but I prefer to fork shirt in a size L, patsmandy at yahoo dot com and I am already getting the newsletter thanks! I'd love the "Daddy needs some love'n" in Large! I already subscribe to the newsletter! 1. My wife likes to spoon . . .
4. I already get the newsletter! My husband NEEDS "My wife likes to spoon" in size xxl. I already get your newsletter, which is why I got the awesome Mom shirt for mother's day! People comment on it everywhere I go! Email me at feymich (at) gmail (dot) com. Thanks! Love the Newsletter , THanks! My husband needs . "My wife likes to spoon" in a med. Everyday I hear, "I need some love'n" when I'm thinking, "yeah, well I need a vacation"! ...so definitely, "Daddy needs some love'n" would be perfect for Papa Day, size XL. I already get the newsletter so we're all set! My husband would absolutely crap his pants over the "My wife likes to spoon" shirt. He wears a size large. I don't want the newsletter but I will definately be visiting this site more often since it made me laugh so much!! I do not want to recieve the newsletter. I like the my dad needs some love XXL size. oh yeah forgot to say I don't need newsletter. Thank you. "Daddy needs some lovin." Size L. I love it! So would Kevin. rachellejune1@yahoo.com, and yes to the news letter. Thanks A Bunch!!!! I like the spoon vs fork shirt in an XXL please. I already rec'd the newletter. JLLockett[at]gmail[dot]com. I love them both! DH would probably prefer the spoon & fork, so let's for with that one XXL, please. Hmmm - I may have to order anyway. Thanks, guys! Hard to choose, but DH would love the spoon & fork in an XXL. I already subscribe to the newsletter which is where I got this link I believe. I would like the My wife likes to spoon shirt in a size Large. And yes to the newsletter. I'd like to have the my wife like's to spoon tshirt in a size medium! and i am off to subscribe! I like the my wife likes to spoon but I prefer to fork in size XL. No thanks to the newsletter... but great giveaway! I would love Daddy needs some love'n in a XXL! These are great! I like "My wife likes to spoon but I prefer to fork" in a large for my hubby. no newsletter for now; maybe later. Daddy Needs Some Lovin' size Medium, and I'd love the newsletter! Daddy Needs Some Love'n. Too cute! Probably in XL. No newsletter at this email. I would love to win the spoon & fork shirt, in an XXL. I would like the "My wife likes to spoon but I prefer to fork." shirt in a size medium! My email is lovelyluckymegs@yahoo.com, but I would prefer not to receive the newsletter, thanks! I like the "Daddy needs some love'n" shirt. No thanks for the newsletter but thanks for the contest. Sure I will take your newsletter! My husband would love to have "Daddy Needs Some Lovin'" in size XXL, please. Daddy needs some love'n in Med. Love to get the newsletter! Daddy needs some love'n. In Xl would be fabulous. Daddy needs some love'n in XXL please! I have to pass on the newsletter though cause I get so much stuff in my box that it messes up my computer. Daddy needs some loving is the best!! I would prefer not to get the newlaer, thanks anyway. I'd like Daddy needs some love'n in size large and no thanks on the newsletter. I would like "Daddy needs some love'n" in size L. In black please. I would like the "Daddy Needs Some love'n" shirt M. garrettsambo@aol.com I do not want to receive the newsletter. my wife likes to spoon,but I prefer to fork in a size medium. 2. 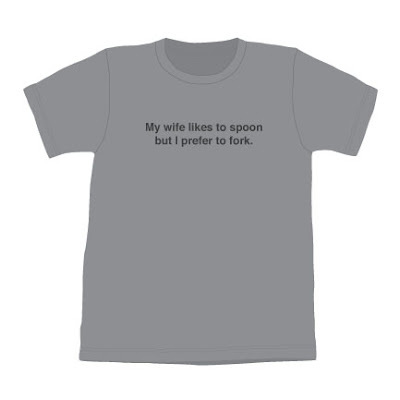 I love the "My wife likes to spoon but I prefer to fork" t-shirt! Please enter me for a size large. 3. My email address is ms.lilyk@gmail.com. 4. I'm already subscribed to your newsletter. Yes to the sign up. My Wife likes to spoon but I like to Fork!!! If I was lucky enough to win, I would like the "My wife likes to spoon but I prefer to fork." T shirt in XXL! Thanks so much for the giveaway! My DH would love the "My wife likes to spoon..." in XXL. No thank you for the newsletter. Daddy needs some love'n in Large. No newsletter. I like the "Daddy needs some love'n." shirt in size 2XL.